Cleaner fluid translates into longer useful life for bearings and hydraulic components such as sensitive servo valves. Hy-Pro's solutions for the hydraulic and lubrication challenges in the power generation industry. Dynamic Filter Efficiency (DFE) is the evolution in hydraulic and lube filter element performance validation and development, and Hy-Pro's competitive advantage. Strategies for proper filter housing selection and how to size housings for optimum balance between fluid cleanliness, low element pressure drop, long element life, fluid compatibility and flexibility for future oil or media selection changes. Understand various types of filter housings and where to apply them for optimum hydraulic & lube oil cleanliness, fluid compatibility, low element clean pressure drop, long element life and flexibility for future changes in oil or media selection. 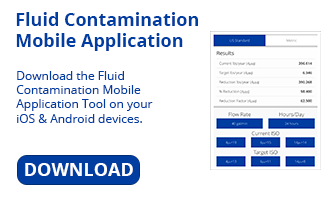 Need help translating your fluid analysis reports into useful information you can act upon? If you see high levels of Ba on your report do you know where it is coming from? Would you know what Ba was? Get fluid contamination under control with innovative products, support and solutions from Hy-Pro Filtration. Glossary of lubrication and fluid relevant terms and definitions. Fluid darkening accompanied by increase in acidity, development of sludge & deposits and a foul burnt odor are symptoms of thermal fluid degradation in phosphate ester fire-resistant fluids. Learn more about the phenomenon and solutions associated with pressure induced dieseling and element spark discharge. Water and particulate contamination reference chart for hydraulic and lube oil. Contact Hy-Pro (info@hyprofiltration.com) to request your copy today! Lube oil systems in steel mills and paper mills are commonly plagued with water contamination which compromises the lubricating properties of the oil and reduces useful fluid life. An introduction ISO Codes. Includes tools to promote understanding of ISO Codes, an aide in ISO Code selection and component life extension tables related to lowering ISO Codes. ISO Fluid Cleanliness Codes (per ISO 4406:1999) are used to quantify particulate contamination in hydraulic & lube oils and fuels. This knowledge base entry provides guidelines for establishing target ISO codes. ISO Fluid Cleanliness Codes (per ISO4406:1999) are used to quantify particulate contamination levels in hydraulic & lube oils and fuels. This knowledge based article will help you to understand what is behind an ISO Code and how it is interpreted. Hydraulics & Pneumatics recently published an article on upgrading filter elements on mobile equipment and the savings that can be realized. Hard copy reprints of this article are available from Hy-Pro if you want to share the story. Hydraulics & Pneumatics recently published an article on DFE filter element development and performance validation testing. Hard copy reprints of this article are available from Hy-Pro if you want to share the story. This article from Tribology & Lubrication Technology details the challenges associated with the global shift from Group I base stock oils to Group II-III base stocks including solubility and lubricity. Didn't find the element you need in our interchange guide? Please use this datasheet to provide the necessary information for us to quote it. Please also include several digital photos and information on the application including fluid, operating temperature and application. Upgrade from antiquated cellulose and polyester media to Hy-Pro DFE rated glass media elements to improve fluid cleanliness, extend filter element life and extend useful fluid life.